The San Francisco 49ers’ fortunes seem to have changed since trading for Jimmy Garoppolo and going 5-0 with him as the starter. Over the weekend, the 49ers signed Richard Sherman, a star cornerback who said he wanted to join a great team with a great quarterback. Garoppolo is still unproven, but his perception around the league seems to make him a great recruiting tool for the franchise. The San Francisco 49ers began last season 0-10, but just one deal has already transformed the trajectory of their franchise. 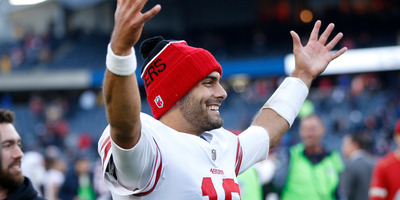 After the 49ers swung the trade for Jimmy Garoppolo, they were 5-0 with him as a starter, with Garoppolo looking every bit like a young, franchise quarterback. Already the deal is paying off. Garoppolo’s five starts were enough to earn him a five-year, $US137 million contract, with $US74 million guaranteed, this offseason. And having a young quarterback, groomed by Tom Brady and the New England Patriots, at the helm is paying off in other ways. On Sunday, the 49ers signed cornerback Richard Sherman, who surprisingly hit the open market when the Seattle Seahawks cut him. Sherman will turn 30 in March, coming off an Achilles injury, so it remains to be seen how effective he can still be on the field. But the perception of his signing is perhaps even greater. Sherman is from the Bay Area and went to Stanford, so the 49ers were a natural draw. But when he became a free agent, he told NFL Network’s Tom Pelissero that he was looking for a great team with a great quarterback. The 6-10 49ers with 26-year-old Garoppolo appear to already fit that category. Additionally, consider what 49ers GM John Lynch said about using Garoppolo as a recruiting tool (via ESPN’s Nick Wagoner). And while Sherman still has to prove how much he has left in the tank, his reputation around the league will only make the 49ers more attractive to other free agents. Top-tier defensive players may want to play alongside of him. Top offensive linemen may want to block for Garoppolo, or skill players may want to be on the receiving ends of his passes. That the 49ers have loads of cap space and other appealing factors like weather and location don’t hurt, either. It may not be hyperbolic when people in the NFL say the quarterback is the most important position on the field. The 49ers are found a player who appears to be a franchise player at the position, and they’re already seeing their team reap the benefits.